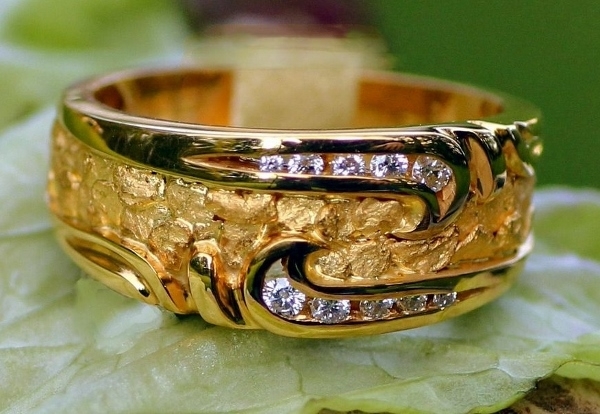 10 brilliant Diamonds with Alaskan Gold Nuggets in this elegant 14kt yellow gold wedding band. Note: Jewelry prices and availability are subject to change without notice. View our "Terms and Conditions" if you'd like more information. Copyright © 2009-2019 Gold Rush Fine Jewelry. All rights reserved. YOUR 100% SATISFACTION IS OUR GOAL! Because no two genuine gold nuggets are the same, you may see an item that you like but has sold. We have a huge selection of natural Alaskan gold nuggets, in all shapes, sizes and price ranges. A similar piece can be made for you. Contact us for pictures of specific pieces in your price and/or size range. However, many of our creations are just that, one of a kind creations and can never be duplicated, BUT another piece of a similar style can be made in most any size and price range. We welcome custom work.